What a great cookbook! I will say this is one of my new favorites! While reading and exploring this book, it seemed like my Pinterest food page in a book! All of the meals really are pretty simple, meaning easy to do and available ingredients. Honestly, sometimes I don't want to/have time to go shopping for a bunch of random ingredients, I just want to use what I have. This book is for those meals, I have the ingredients and most only take about an hour at the most. This book is split up into categories: Dutch oven, skillet and sauté pan, slow cooker, roasting pan and baking dish, pressure cooking, stockpot and saucepan, and desserts. On a few of the recipes the variations are split three ways, such as pork stew-here are three different recipes for pork stew. The pork stew with asparagus and peas, linguine with tomato and basil, and pork chops with bacon and cabbage are the top recipes for me! This book has a picture for each recipe, which I really like in a cookbook. This is a great cookbook, I can't recommend it enough! 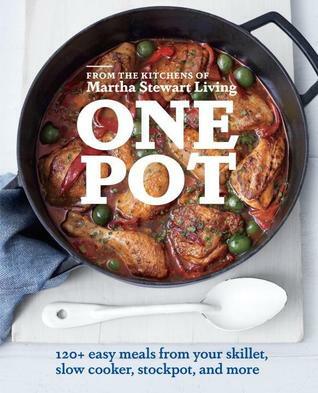 Simple one pot meals that taste yummy!